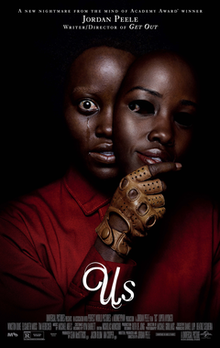 Oscar-winning director Jordan Peele released his second major motion picture, “Us,” on March 22, 2019. While similar to his debut, “Get Out,” Jordan Peele’s latest feature has earned mixed emotions from audiences. “Us” has a deeper meaning than it originally revealed during the film and audiences were forced to think deeply about the plot. Many people left the theater saying that they were confused, which is understandable. The trailer left many expecting a traditional “horror” movie and were shocked when it unraveled into more of a psychological thriller. The movie starts out with a young Adelaide Wilson, played by Lupita Nyong’o, at a Santa Cruz amusement park going into a mirror maze — scared to death. Then the movie jumps to present day back at the same place, but Adelaide has a family. Her husband Gabe Wilson, played by Winston Duke, her daughter Zora Wilson, played by Shahadi Wright Joseph, and her son Jason Wilson, played by Evan Alex, are with her on this family vacation. One night, the tethered family from underground Santa Cruz comes to the Wilson’s house, Red, her husband Abraham, her daughter Umbrae, and her son Pluto. They start to attack them and try and take over the world with the rest of the tethered. The tethered is a group of clones of the families inhabiting Earth from underground. The entire movie is packed with foreshadowing that does not click for the viewer until the last scene. For example, Jason has a mask throughout the movie, foreshadowing his doppelgänger who wears a mask to cover his facial scarring, due to burns. As expected with Peele, scenes dripped with symbolism. The movie depicted the underground Tethered world with a hellish sense of doom, parallel to the life the forgotten members of American society face. This movie uses great shots of zoom outs and over the shoulder shots to emulate that the characters are all different. 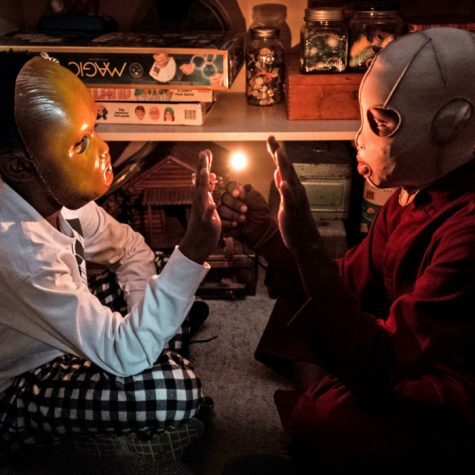 For example, when Jason and his doppelgänger Pluto are in the closet together, the scene shows the two of them in a wide shot, which shows that they are different characters in the movie, but the same actors. Along with these great character shots, Jordan Peele also shows shots of both the tethered world and above by switching between both worlds using jump cuts. It really shows the difference in the lighting of both places with more of a darker tone in the tethered world and our world. The first words we hear from Red are, “Once upon a time, there was a girl and the girl has a shadow. The two were connected, tethered together,” she says in a painfully raspy voice. In an article by the Atlantic, Nyong’o had vocal training on her voice to play the part of Red. She talked about how she was coached by an ear, nose and throat doctor, vocal therapist and a dialect coach on how to get Red’s voice like that. Nyong’o also filmed her scenes with her two characters on different days, which was outstanding considering she was technically acting along. Director Jordan Peele has explained the movie in great detail, so people could understand it better. In Esquire.com’s article, “This movie’s about maybe the monster is you. It’s about us, looking at ourselves as individuals and as a group,” he says. This explains many aspects of the film and what he is trying to portray. He wants to show that some people are disregarded in today’s society and it should not be this way. This was a great movie with great themes and symbolism because he is trying to portray something about people that they have never seen before. This is a movie that audiences should see at least two times to get a true understanding of it.